You really want me to go out in Tropical Storm Irene! Look at the leaves! They are everywhere! The good news is, my humans brother's teepee is still standing! If you listen carefully, you can hear the wind...it's very blustery here! This poor old tree is about 50 year's. My parent's planted it on the farm when they first moved in. It blew over this morning. Thankfully it fell towards the pool and not the horse field. Oh, boy! I hope you guys are safe ... stay indoors and keep the windows shut! Maybe it's almost over? We're glad you're all okay and safe right now! Paws crossed for all to be well and for the storm to soon be over. I was just going to say it's good it was only leaves...till I saw the tree!! So glad you are all fine and no major damage! Awwwww are you all ok? Me and Charlie hope you are all safe and well! 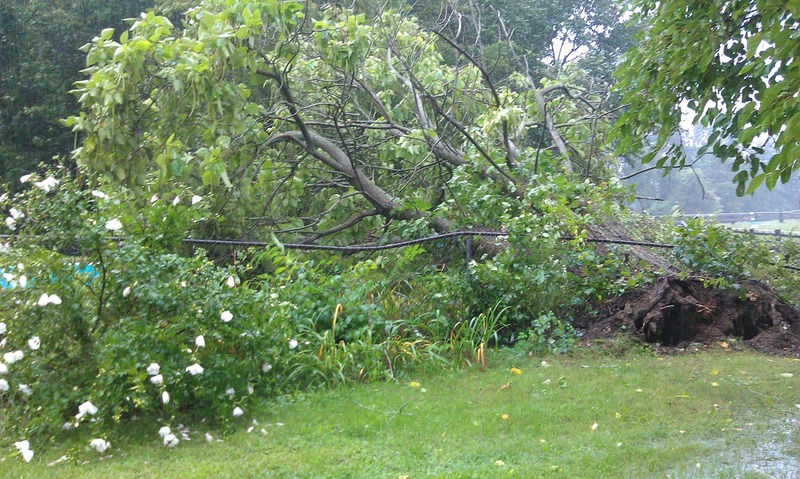 We are so sorry for the tree that got blown over! :-( It had such history for you all. Awwww!! Stay safe, hope it wasn't too bad there, we have heard that some parts of MA got lots of rain and wind and now flooding. Stay safe. That's a pretty cool teepee! 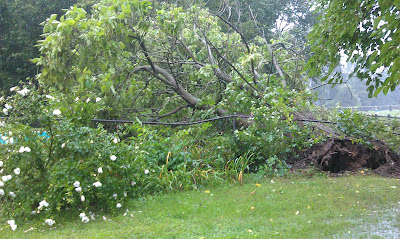 I'm glad Hurricane Irene didn't knock it down. And I'm sorry that the tree got blown over. That's sad, it's older than I am. So glad that tree didn't hurt anyone! Wow, I'm sorry about that grand, old tree...it's a shame to lose it. But, I'm glad your territory seems to be okay and your whole pack is safe. Oh, no. It's so sad when a tree goes down, but one that has special memories is even worse. A very scary weekend all round! Glad to hear that you are all okay but it's sad when trees with special memories go down. I'm glad that you came out safe. Too bad about that cool old tree, though. We're so happy to see that the teepee was spared! What a bummer about the tree.